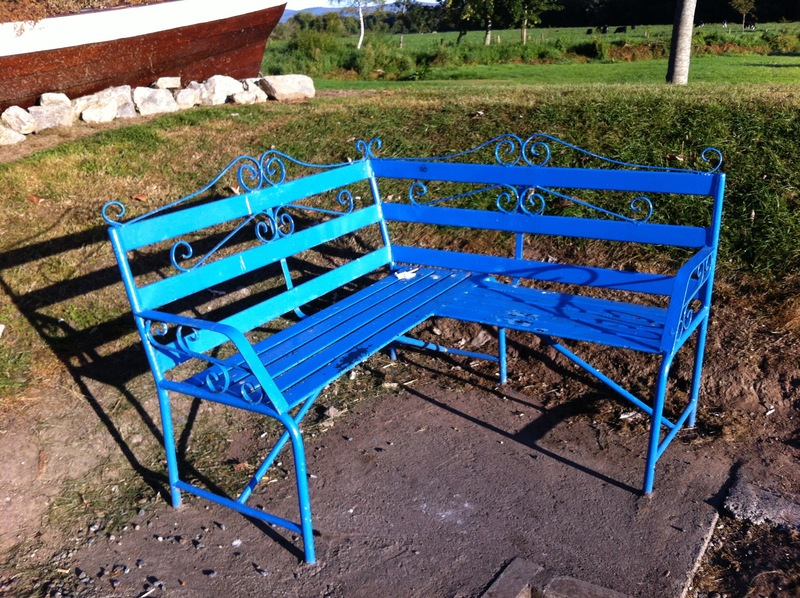 The bench in Ardfinnan gets repainted in the spring. First it was blue and then it was red and now it is blue again. There is not a lot of room to sit as the home-made corner structure does not allow for a lot of knee room. Two people can happily sit and chat but anymore than that will feel a bit squished. A tree fell down in Joe’s field. We have not had great winds. We have not even had heavy rain. It looks completely wrong to see this tree lying down. 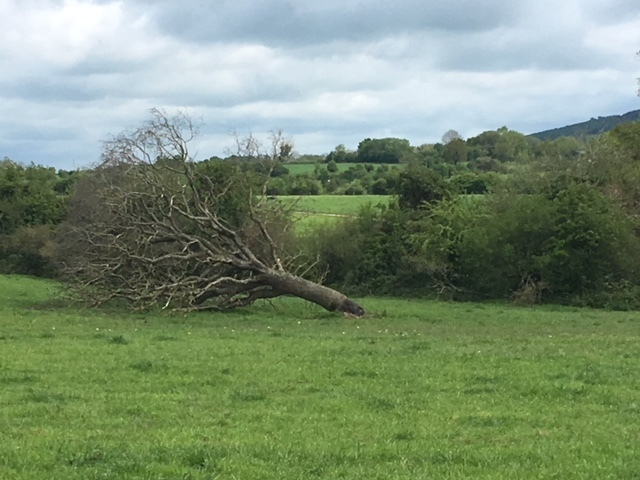 The tree is on a low bit of the field. It is often squishy and muddy down there. All I can think of is that the roots got wet and wetter and stayed wet and finally rotted. I have never lived anywhere where trees fall down so frequently. The mass path is blocked by fallen trees several times a year. Sometimes I think it is to do with the kind of trees. Maybe these trees have shallow roots. Most of the time I think it is to do with just too much water. We have had a week without hot water. Niall the plumber came today. He apologized. He kept promising to come each day but then each day he never arrived. He said he had been Dead Busy. He said it’s always the same with the work: Famine or Feast. Famine or Feast. Famine or Feast. He said it three times and then he went to work. He installed a new immersion unit. He showed us the old one. It was covered with lime. This is a terrible area for lime in the water. It coats and cakes onto everything and eventually destroys machinery. 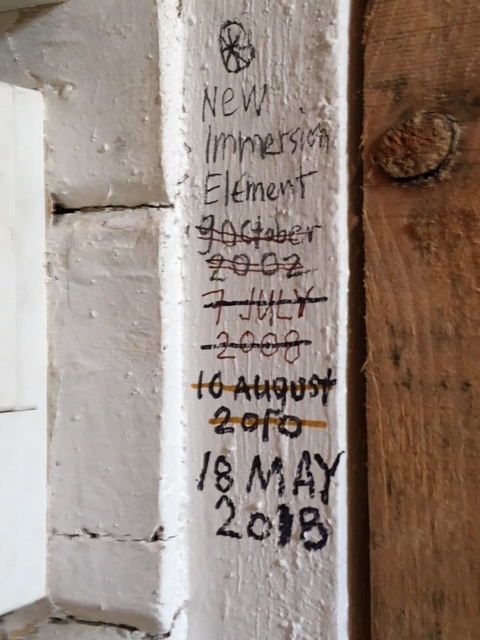 He was smitten with the date notations I have made on the wall each time we have had to replace the heater. He was surprised with how long the previous unit had lasted. He said he hoped that this new one would last as long as the old one. As he left he instructed us to be sure to mark today’s date up on the wall. They are back. The season is on for the Sticky Back weeds. Sticky Back. Sticky Jack. Cleavers. Sticky Willy. Robin-run-the-hedge. They are everywhere. They run up anything that is growing. They tangle in and out between anything that is growing. Because they are covered with things that make them stick to whatever they touch there is not much need to worry about what or where they go. They stick onto animals and clothes as well as plants. 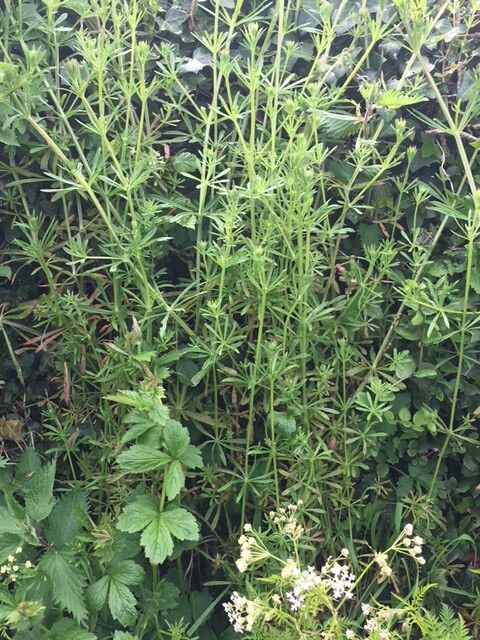 These weeds are so fast growing and so busy that they look like they are strangling anything they touch. In fact the growth is more like a fishing net that is thrown over things. One good grab and the whole clump comes away in the hand. Of course a good pull does not remove the roots. The plant just breaks off at the bottom. I do not really care. If they are pulled away from things they do not seem to grow back immediately. They will return next year no matter what. It is a seasonal thing and the season does not last long. While it is happening the Sticky Backs are everywhere. I love pulling them off things. If I am passing in a car I get the urge to just stop and get out to pull the big clumps off the ditches. Sometimes I do it. 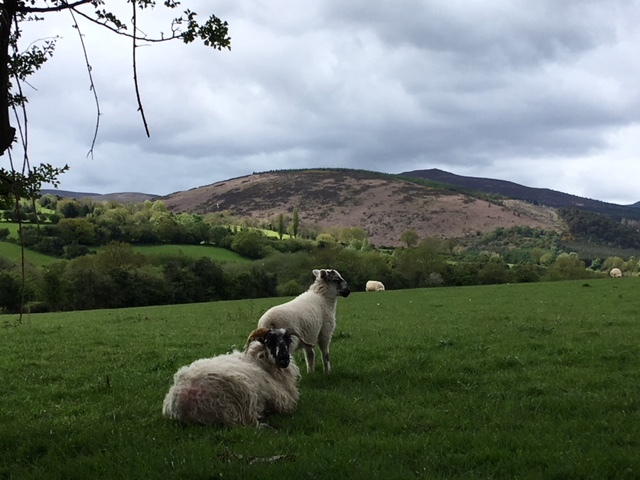 When I am walking, I keep slowing down and pulling and slowing down and pulling. I can grab an armful without even coming to a full stop. Of course there is the good chance that I might grab a stinging nettle or a thorny bramble. Sadly, I do that often. Stings and stabs do not stop me from this obsessive pulling. It is the most satisfying kind of weeding work ever. I seem to have the urge to pull it all down from everywhere in the world which is, of course, not even vaguely possible.